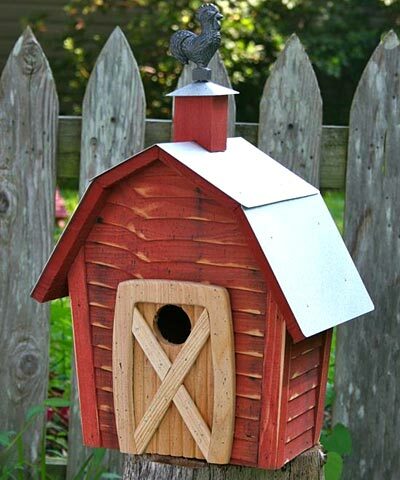 Celebrate the rustic barns of the past in your yard with the Heartwood Redwood Rock City Bird House. This clever home pays homage to barns throughout the United States that once advertised the Rock City roadside attraction. The lapped siding, tin covered roof, and faux barn door add a realistic hint to this home, and its red and tan color scheme furthers the rustic feel. A square vent extends from the top of the roof, and a cast iron rooster figure stands watch here for a touch of whimsy. The 1.5" diameter entrance hole invites a wealth of birds to seek shelter in the item, and the overhang of the roof protects the home from rain. A metal panel on the back of the barn may be removed for seasonal cleanings, and gaps on the sides of the roof help regulate the nest temperature. Use a mounting bracket (not included) to attach this home to a pole or post in moments. The wooden construction easily withstands the elements and will remain beautiful for several seasons. Create a charming country scene in your yard with this Redwood Rock City Bird House. Made in the USA. Heritage Farms Birding Pole Kit, Black, 6' x 1" O.D.